Australia Day at Lake Canobolas. Every imaginable type of craft dotted the water’s surface: kayaks, canoes, paddle boards, sail boats, air mattresses and one particularly fetching inflatable lounge setting. The air was perfumed with the aroma of barbeques and groups of friends and families spread out on the grassy shores to enjoy the day. 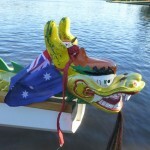 Over the hubbub of festivity one sound reigned supreme, the bang, bang, bang of the Dragon Boat drum! Yes, we certainly made our presence felt on the Lake yesterday when we held a come and try session. Some of our ‘tryee’ paddlers had come especially for the opportunity, while others saw the fun that we were all having and signed up for the experience. 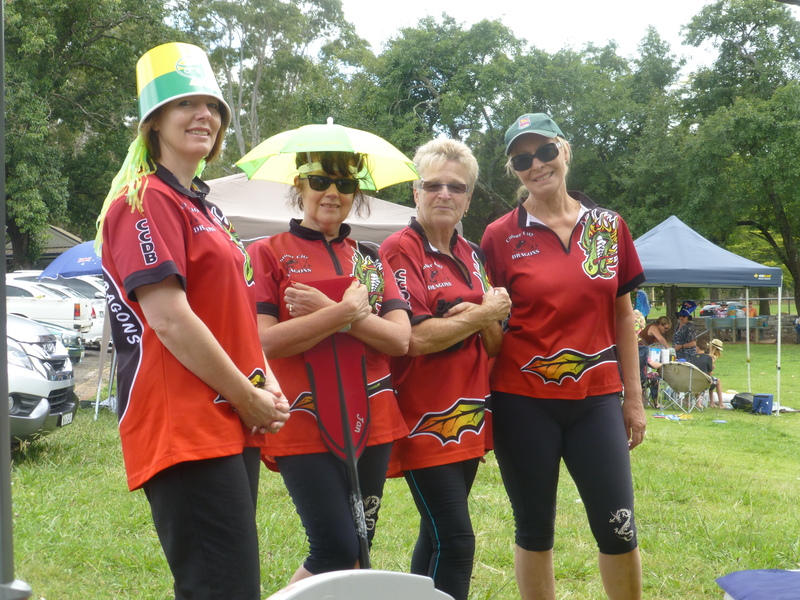 Club members got into the spirit of the day donning silly hats in green and gold. The verdict was that the umbrella hat and paddling didn’t go well together and they were gradually relegated to the bottom of the boat. Thanks to all of our members who helped out either as paddlers, drummers or administrators. And as always a huge thanks to our sweep, Phil, who carefully negotiated his way through the crowds ad ensured that we all arrived safely back on shore (even if a little damper than usual). Do Something Different This Australia Day! 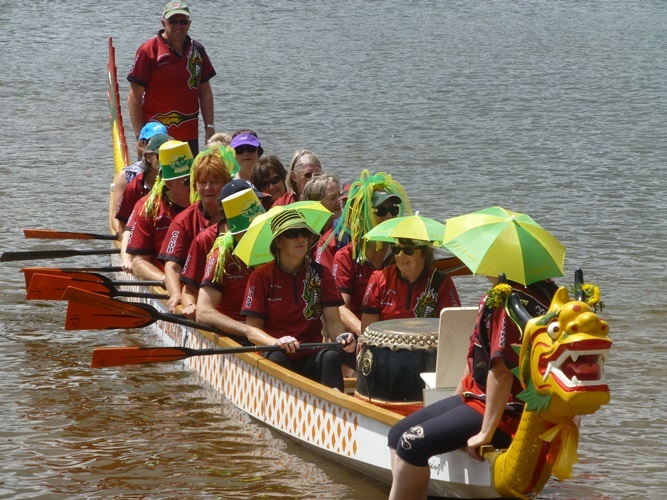 Why not try Dragon Boating? 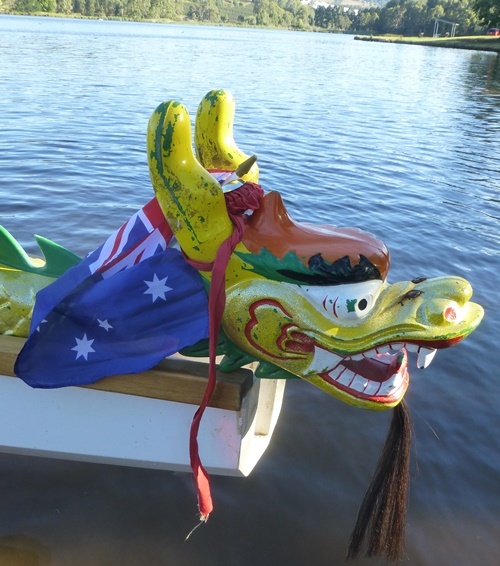 On Australia Day 2015 ( Monday 26 January) Colour City Dragons will be having a ‘come and try’ session at Lake Canobolas. We will be there between 11am – 2pm and would love to share our love of paddling with others. Our informal ‘do you want to have a go?’ invitation to folk at the Lake on New Year’s Day resulted in a number of converts. Encourage friends, colleagues and family to come and see what all the fuss is about before perhaps enjoying a picnic at the home of paddling in Orange, our beautiful Lake.